The German chancellor has said she wants Greece to "remain part of our story" ahead of elections that could cast doubt over the country's future in the eurozone. Angela Merkel called for unity on the last day of political campaigning. Both Syriza and the New Democracy party will hold their final rallies later. The possibility of a left-wing Syriza victory in Sunday's vote has sparked fears that Greece could default on its debt and exit from the euro. Mrs Merkel urged the country to remain a part of the eurozone on Friday. "At the heart of our principles lies solidarity," she said during a news conference in Florence with Italian Prime Minister Matteo Renzi. "I want Greece, despite the difficulties, to remain part of our story." Speaking to crowds of supporters on Thursday night, Syriza's leader, Alexis Tsipras, repeated his promise to have half of Greece's international debt written off when the current bailout deal ends. He said an end to "national humiliation" was near, as opinion polls showed the party in the lead with just days to go until the vote. Greece has endured deep budget cuts tied to its massive bailout from so-called troika - the EU, International Monetary Fund and European Central Bank. Opinion polls suggest the gap between Syriza and the conservative New Democracy party, which heads the current government, is widening. Syriza has moderated its stance since the peak of the eurozone crisis, and says it wants Greece to stay in the euro. 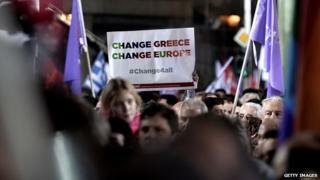 But critics say that what the party is advocating may mean Greece will be forced to leave the eurozone whether it wants to or not. Mr Tsipras has vowed to renegotiate the bailout agreements and to restructure country's the debt, which is currently 175% of GDP. Media captionCafe owner Yiannis Tsakiris: "Europe is ready to listen after all these years"
Prime Minister Antonis Samaras' New Democracy party holds its final campaign rally in Athens later, while the Syriza leader will be in Heraklion. Syriza is tipped to win the vote but without an outright majority, and analysts say the party may struggle to find a coalition partner. Mr Tsipras has said he will not govern with those who support what he has called the policies of Chancellor Merkel. Germany is seen in Greece as taking the hardest line on its debt. Earlier this month, a spokesman for Mrs Merkel said Germany expected Greece to uphold the terms of its international bailout agreement.